Since my days in grammar school, I have been fascinated by chemistry. Watching two colorless liquids combine to produce a beautifully colored solid, bubbling volcano, on something that explodes was exhilarating. Magical. Now as work allows me to see some of the great technological advances going on in the world I am still awestruck by the magic of chemistry. At it’s essence what we do with plasma surface treatment is really a story about changing the chemistry of surfaces to make magical things happen. We make things adhere that would not stick before, or deposit a coating a few molecules thick that stop corrosion. I also get to work with many of the brightest and most talented chemists in the automotive, aerospace, medical device, and electronics industry. Some of these folks were part of the 150-strong group that participated in our recent Silicon Valley Open House and Surface TechDays in Hayward, California. It was a technology packed two-day event with 18 technical presentations touching on everything from how plasma is enabling engineers to make better giant airplane wings to tiny laboratories on a chip. 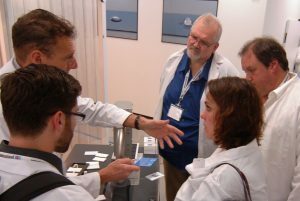 In addition to these talks, a dozen laboratory demonstrations allowed visitors to see how plasma can enable new applications up close. But what also impressed me was the chemistry happening at the event itself. In the crucible of the applications lab, using the energy of the group, with Plasmatreat’s technology as a catalyst — experts in chemistry, physics, plastics, metals, and composites mixed together. And this mixture produced a number of exciting new ideas. They say that greatest creative insights come from the synthesis of relatively well understood ideas. That was certainly true for those at Surface TechDays. I look forward to sharing some of the specific technology and insights with you in upcoming blogs and our plan to organize another Surface TechDays event in another location soon. For now, I wish to thank our industry partners for help proving the the active ingredients that produced such a great reaction in Hayward. Attendees will have the opportunity learn, network, and see hands-on demonstrations in our new Silicon Valley laboratory. The second reason for attending that people mentioned related to the technical partnerships that Plasmatreat has established with other suppliers. The eighteen talks listed above are not the kind of arbitrary set of disconnected topics you often find at typical industry conferences. Instead, they demonstrate a commitment to coordinate efforts, and make upstream and downstream pieces of the manufacturing process work together to solve problems, or to develop something new. These talks are often the result of countless hours of engineers and technicians working together to solve surface related manufacturing problems. That might be how to automate plasma treatment for high-volume 3D applications, to improve adhesion of dissimilar materials, or to overcome challenges of bonding curved electronic displays. In these presentations, attendees see first-hand demonstrations of how teamwork has produced impressive results. In the 1980’s Ronald Reagan famously quoted the Russian proverb “doveryai, no proveryai”, or “trust but verify” in describing his cautious approach to foreign relations with the Soviet Union. Deming founded the four-step Plan-Do-Study-Act management method used for the quality control and continuous improvement of manufacturing processes and products. It is widely acknowledged as a cornerstone of Kaizen, Lean manufacturing and the success of the Toyota Way. With over 6,000 systems in operation using over 20,000 plasma jets, Plasmatreat customers can trust that Plasmatreat technology can provide impressive surface treatment and corrosion protection results. Still, we recommend that customers work with us to test their application before committing to production, and to monitor their surface treatment process routinely to assure that it continues to perform as specified. The idea of rigorous process characterization is so important to us, that Plasmatreat manufactures and supplies our own line of Plasmatreat Testtinte dyne inks that offer a quick, simple, and very cost-effective way to characterize a substrate’s surface energy (http://www.plasmatreat.com/test-inks-onlineshop/). However, although dyne inks are great for measuring surface energy and work better than comparable dyne pens, they are somewhat subjective tools to use. For applications that require a simpler and more quantitative and objective approach to surface measurement, we have also established some strong partnerships with companies that specialize in specialized equipment useful for measuring the efficacy of the plasma surface treatment process. BTG Labs (www.btglabs.com) located on the Northern edge of Cincinnati, Ohio offers the Surface Analyst, a fast, easy, accurate and non-destructive handheld instrument for characterizing the surface energy materials based on an automated contact angle measurement approach. Manufacturers in the aerospace, medical, automotive, electronics and consumer goods segments use the Surface Analyst for critical manufacturing processes. The Surface Analyst can either display the contact angle, or (as pictured above) can be used in a simple “Pass/Fail” mode in production. Data can be downloaded via USB port to a computer for record keeping, SPC, and further analysis. Photo Emission Tech (PET) Inc. (www.photoemission.com) manufactures and markets non-destructive, non-contact surface contamination, thin film, and coating detection down to the Angstrom level. The PET systems rely on Optically Stimulated Electron Emission, or OSEE, a principle based on Einstein’s Nobel prize winning photoelectric effect. 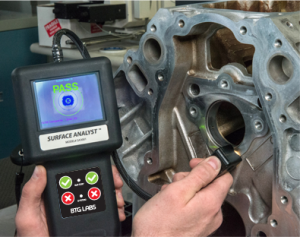 As a tool for measuring surface cleanliness on conductive substrates, PET’s computer-driven OSEE measurement system is capable of validating the cleaning quality of parts with extreme accuracy and sensitivity. Plasmatreat is a means to end. That end might be building a longer lasting engine, a stronger airplane wing, a safer medical device, or a more reliable printed circuit board. In achieving these feats, plasma is normally part of a complex chain of other upstream and downstream processes that need to be coordinated in order to achieve the intended result. 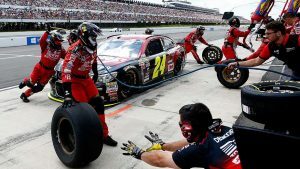 Examples of the importance of teamwork abound – whether it’s to put a man into space, win a NASCAR race, or perform a delicate surgery, each expert relies the expertise of others on the team, and the result depends on their close coordination, good communication, and problem solving while working side-by-side. A perfect example of how assembling a team of experts can produce impressive results will be on display in Düsseldorf Germany, October 19-26, when Plasmatreat and AKRO-PLASTIC will join forces with KUKA, ARBURG and Krallmann at the Plasmatreat booth at the K 2016 show to present live demonstrations of a new plasma hybrid injection molding process and turnkey atmospheric plasma unit. The K 2016 show is the world’s leading trade show fair for plastics and rubber technology. Plasmatreat and AKRO-PLASTIC teamed up to develop a solution to potential delamination and failures at the interface between plastics and metal. These failures pose serious and persistent concerns for injection molding manufacturers who produce components that combine dissimilar materials such as for automotive light-weighting applications. A two year research effort by Plasmatreat and AKRO succeeded in developing a process that customizes the composition of an anti-corrosive plasma-polymerized layer according to the composition of the corresponding plastic compound. The resulting process parameters ensure a reliable, stable, and exceptionally strong bond on the injection-molded part. The fully automated PT1200 plasma cell can be adapted to suit any conventional injection molding machine. This increases production speed and allows for a continuous production of injection molded plastic-to-metal components. The PT1200 cell includes the plasma generator, robot, control technology, plasma control unit (PCU), plasma jets, cables and consumables. Users can customize the system for their process as required. To process parts, a 6-axis robot, or, for smaller profiles, a 2-axis gantry system, positions the metal inlay beneath a Plasmatreat Openair atmospheric plasma jet. The plasma jet removes contamination from the part’s surface and simultaneously activates the surface chemistry for coating. A second plasma jet applies a thin-film functional coating. The coating application is based on the patented PlasmaPlus process developed by Plasmatreat and Fraunhofer IFAM. The plasma cleaning and coating process takes only seconds to complete, and provides a dry, environmentally-friendly alternative to the slower and less effective chemical cleaning and priming processes conventionally used in hybrid injection molding. The Plasmatreat process eliminates the need for time consuming intermediate steps such as storage and drying, and allows components to be processed immediately after coating. Coated metal parts are transferred from the plasma cell to an injection molding cell. On entering the injection molding cell, a robot briefly maneuvers the parts under an induction heater before loading them into the mold. The PlasmaPlus coating creates a strong, covalent bond between the metal and the injection molded plastic. Supported by our trade fair partners KUKA for robotics, ARBURG for injection molding machinery and Krallmann for mold design and construction – Plasmatreat and AKRO-PLASTIC will demonstrate the entire process and provide K 2016 attendees with stainless steel sample parts that have been over-molded with PA6 GF30 plastic. This new manufacturing process and its impressive debut at “The K” would not be possible without the teamwork of a talented and dedicated group of industry suppliers, I am proud to be part of this great team, and I hope you will visit our K Show booth G04 in Hall 11, or contact me for information about this new process if you can’t be there to see it. Plasma is an all-star in the role of cleaning, activating, and coating surfaces to make them for printing, coating or bonding. But the most successful applications are often those where there is coordination and teamwork with other parts of the manufacturing process such as process control, material handling, dispensing, or curing. This webinar discusses the latest trends in electronic display manufacturing such as changes in substrates, flexible and curved displays, and UV LED curing. For our part, Plasmatreat will discuss how plasma excels at cleaning and activating plastic and glass substrates for better performance. Our partners will discuss advance s in adhesives and sealants, dispensing and curing equipment, and system integration. But the real benefit of this initiative is in providing customers with an integrated, team-oriented, solution. Many plant managers have learned the lesson of loyal Bulls fans – even with the best players, it often takes a team to win. Casey Stengel said, “finding good players is easy – getting them to play as a team is another story.” Teamwork avoids the blame and finger pointing when things go wrong. I am proud of Plasmatreat, but I am also proud that Plasmatreat has teamed up on so many occasions with leading industry suppliers to produce a successful process. While many of Plasmatreat’s success stories can’t be told because of confidentiality and non-disclosure agreements that protect our customers processes, one story about how plasma is enabling one of the world’s top automakers produce better cars has made it to the small screen. Since its 1966 debut, the General Motors Chevrolet Camaro has become one of the most iconic high performance cars in America. The 6th generation Camaro introduced for the cars 50th anniversary, the 2016 Chevy Camaro, is an amazing display of styling and technology. The 2016 Camaro uses engines built at GM’s powertrain plant in Romulus Michigan. Plasma surface treatment, supplied by Plasmatreat, is used to clean and activate the surface of the engine’s front cover before applying a sealant that helps secure the cover to the aluminum engine block. This seal is critical to the engines performance and longevity. While the entire video is fascinating for both car buffs and fans of the latest technology, those who want to skip directly to the plasma treatment process can fast forward to the 9 minute and 40 second mark for Plasmatreat’s performance. We’re proud to be associated with the 2106 Camaro, GM, and a long list of customers who have proven the value of plasma and PlasmaPlus® in a wide range of demanding applications. We’re glad they think enough of us to share the story on TV. — Action! I was intrigued by a presentation I saw by the RAMPF Group. The RAMPF Group, based in Wixom, Michigan supplies polyurethane, epoxy, and silicone for sealing, foaming, bonding, casting, and coating. They also manufacture mixing and dispensing systems for applying single- and multi-component polymers in the automotive, electronics, and other high tech industries. Today, RAMPF ships over 1,000,000 parts a year to automotive assembly lines. So, the people at RAMPF understand the importance of thinking through the whole process. RAMPF appears concerned about two trends that affect their reactive resins business. First, is the continuous raising-of-the-bar when it comes to performance specifications. Their OEM customers are making products that have better UV stability, offer better thermal and chemical resistance, and provide better mechanical properties. Second, the increased use of plastics and composites driven by the desire to reduce weight, has also been accompanied by the greater use of more recycled materials to cut costs, and processing new engineered substrates before they are properly tested. 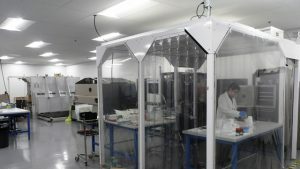 This means their customers are often using materials that are more and more “undefined,” and changing substrates without testing the effect on important properties like adhesion. RAMPF claims that 90% of the reported problems relating to joining are due to problems with the process. Plasmatreat agrees with these observations. And although we recommend thorough process testing before implementing any new process, plasma also provides some safeguard against potential problems from day-to-day changes in process parameters. In many cases, adding plasma surface conditioning enhances substrate performance and provides more process latitude. Thus plastic and composite part manufacturers have found they can improve the reliability and consistency of their process by using plasma. Our process engineers work customers in our labs, and in their plants lines to establish, optimize and find the limits of their processes. 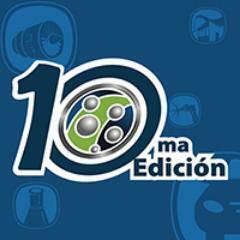 I recently returned from the BajaMak trade show in Tijuana, Mexico. It was fascinating to get a better sense of the emerging—and rapidly growing—maquiladora manufacturing climate. These geographically desirable Maquiladoras, or “Twin Plants,” have grown with the return of manufacturing from places like China. Even these small trade shows are beginning to see the presence of large U.S. and Mexican concerns like Thermo Fisher and Medtronics. The trade show was a success from the Plasmatreat perspective in that there were many solid engineering contacts interested in introducing cutting-edge plasma surface treatment to their manufacturing processes. The interest in Openair plasma treatment ranged from medical devices, to electronics, to automotive. In Baja, we’re noticing a trend toward a sophisticated and innovative approach to manufacturing as a whole. What was traditionally dominated by manual processes, is now being automated—a perfect fit for our inline Openair plasma system! Right now Plasmatreat is actively working on projects with our partners SEI Automation and Bajarep to support both our Spanish- and English-speaking customers along the manufacturing corridor. This is a reflection of global network and our dedication to providing excellent support to all customers. It is exciting to see Plasmatreat as part of the solution in these evolving markets! Cleaning, wetting, and surface activation is necessary to guarantee robust and reliable adhesive bonding of plastic and composite materials. In a previous post, We Have a Water Problem, liquid cleaning was shown to be an inferior choice due to consumable costs, process control issues, and energy required to clean and dry the parts or components. The old adage of, “You are only as clean as your last rinse,” is really true. For bonding preparation of low-surface-energy plastics, adhesion promoters and primers are well known and have been a common choice for decades. The adhesive providers have done a good job in making these primers work for a wide variety of materials and applications. There are many approaches and chemistries offered, including aggressive acid or alkali etching and some aqueous systems. However, the most common priming systems for plastics contain high percentages of solvents, such as toluene, acetone or methanol, with the addition of highly profitable “Pixie Dust” chemistry additives. These liquid solvents typically attack (solvate) the plastic surface leaving the “Pixie Dust” chemistry on the surface. Keep in mind that when you purchase a consumable primer, you are mostly buying solvents, with their associated hazards and process inefficiencies. You own that chemical for its entire life cycle, from the receiving dock to emissions and hazardous waste streams. Again and again. Other undesirable attributes of a wet priming process are application issues such as mixing and masking, and energy costs to apply and cure the primer. Time to apply and cure the primer may be the worst deficiency of wet primers. I have detailed some of these issues directly from the MSDS and Data sheets of typical and popular liquid primers for plastics. HANDLING AND STORAGE – Store in cool, dark place preferably between 60-75 degrees, away from sparks, flames and sources of ignition. Storage conditions can adversely affect properties. HEALTH HAZARDS – EYES: Can cause severe irritation, redness and tearing. HEALTH HAZARDS – SKIN: Prolonged contact can cause severe irritation and rash. HEALTH HAZARDS – INHALATION: Can cause nasal and respiratory irritation dizziness, weakness, fatigue and nausea. Also can causes kidney damage, liver damage in lab animals with chronic expos. FIRE/EXPLOSION HAZARDS: Vapors are heavier than air & may travel along ground and be ignited by pilot lights, other flames or sparks. SPILLS: Eliminate all possible sources of ignition such as pilot lights and flames. Absorb liquid. Stop spill at source. STABILITY/MATERIALS TO AVOID: Avoid contact with strong oxidizing agents. May form toxic materials such as carbon monoxide, various hydrogens and nitrogen compounds. WASTE DISPOSAL: Destroy by liquid incineration or dispose in approved landfill in accordance with local, state, and federal regulations. TIME: Apply and cure per instructions. Wait and watch it dry. Do you really have the time to prime? THERE IS A BETTER WAY: Plasmatreat’s Openair® Atmospheric Plasma cleaning and activation can replace wet primers. Using only compressed air and electricity, Openair® priming activation is fast, touchless and dry. Plasmatreat is thrilled to have a horse in this race, so to speak. Atmospheric plasma pretreatment of carbon-fiber-reinforced plastic (CFRP) components for the Punch Powertrain Solar Team’s racing car, Punch One, is an integral part of the car’s speed and strength. Stiffening ribs in previous iterations of the car, necessary to protect it from strong race-condition vibrations, had been laminated—but this process required multiple layers and lengths of prepeg strips, a labor-intensive process that also increased weight. Plasma pretreatment enabled the use of Loctite EA 466 instead, a fast-curing two-component epoxy resin adhesive. The production manager of the 16-strong solar car team – who is just 23 years old – enthusiastically backs his team’s decision to use atmospheric pressure plasma in the new car to improve the adhesion of the CFRP components. This approach not only greatly reduced the time taken to pretreat the CFRP, but also achieved a 3 kg weight savings compared with the previous method. CFRP is 60 percent lighter than steel and around 30 percent lighter than aluminum, but extremely stable. The total weight of Punch One is just 165 kg (around 364 lbs. 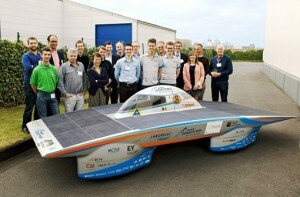 ), with the heaviest single component being the solar battery. Needless to say, we are excited and proud to cheer on our contender as it traverses Australia this week. Go Punch One!